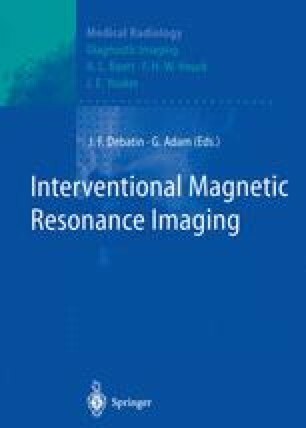 Prerequisite to the safe execution of an interventional procedure is the ability to accurately visualize any instruments in relation to the MR image. These interventions might involve a percutaneous route, such as a biopsy, or endovascular or endoluminal access. In contrast to X-ray, visualization of interventional instruments in MR has proven to be difficult. Excellent contrast between the instrument and surrounding tissue can be obtained in X-ray through the use of high-atomic number metals such as gold or tungsten. These materials provide large attenuation of incident X-rays, rendering the instrument visible with high resolution.